Hey there! Looks like you're enjoying the discussion, but you're not signed up for an account. When you create an account, we remember exactly what you've read, so you always come right back where you left off. You also get notifications, here and via email, whenever new posts are made. You can like posts to share the love. Join 92203 other members! Anybody can ask, anybody can answer. Consistently helpful members may be invited to become staff. Here's how it works. Virus cleanup? Start here -> Malware Removal Forum. What I'm trying to say is it won't do any good. Until you have a valid operating system... there is nothing more that can be done because if I clean your system further... you will no longer be able to boot it up. If it takes you more than 5 days to rectify this situation and the thread gets closed... it's no big deal. Just PM me (or one of the moderators or admins) and we will open the topic back up. Worse case scenario is you could start a new thread for help. Btw, I have got programs that signs in automatically without me typing in the password, and, I already forgot the password of one of it, how can I back it up with its password saved in it ?!!. As if I changed my current windows, it won't remember it.. !. I forgot to tell you that the email I registered with in that program has been hacked !. We did not do anything that should stop you from saving your passwords, however, ComboFix may have modified some settings so lets reset them. 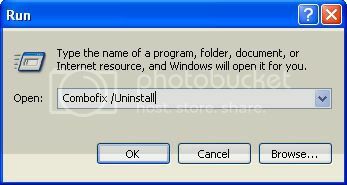 Now type ComboFix /Uninstall in the runbox and click OK. Note the space between the X and the U, it needs to be there. What program did you have to register an email with?